BB cream vs. CC cream: What's the difference? Known as "blemish balms" or "beauty balms," BB creams started rising in popularity in the 2000s with Korean pop stars and actors for its ability to make skin appear porcelain-like and flawless on camera. It was introduced in Korea in 1985, but its existence roots back to the 1960s with German dermatologist Christine Shrammeck creating the first balm to protect and heal patients' skin. After Song Hye-Kyo revealed BB cream as her skincare secrets, sales for BB cream skyrocketed. And so did her endorsement offers. In 2012, cosmetics companies began introducing BB creams in North America. Asides from the skin whitening properties, the BB creams in the Western market are similar to the original Korean balms. It functions as both a cosmetic and skincare product, acting as a tinted moisturizer, foundation, primer, and even a light sunscreen as some product may have SPF coverage. BB creams are mainly a cosmetic with skincare components, some will have anti-aging properties as well. 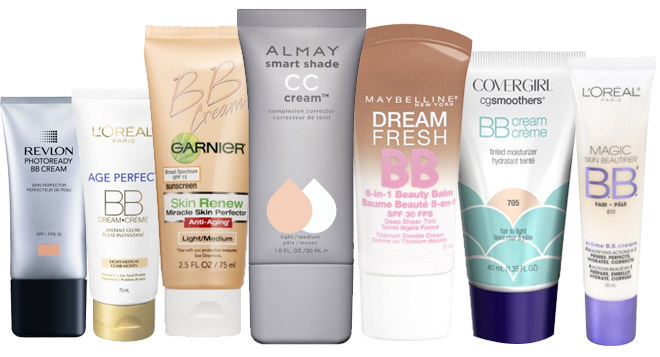 BB creams provide lesser coverage than its alphabetical neighbour, CC creams. If BB creams are considered a cosmetic with skincare benefits, then CC creams can be considered skincare with cosmetic function. As a complexion corrector (CC) cream, its made to focus on correcting skin colour-related issues including acne, redness, dark spots, sallowness, or dull skin. CC creams were introduced after the popularity of BB creams. Although it varies across the many brands, CC creams generally have more anti-aging properties than its predecessor. "CC cream is colour correcting, for someone with spots and damaged skin. I usually recommend BB cream for younger women," a beauty expert at Shoppers Drug Mart's Beauty Boutique tells me. "You don't need a CC cream unless you need to cover up marks and spots."